– Alison Uttley and Little Grey Rabbit. – 50th Anniversary of Grey Rabbit’s May Day. – Does anyone know why Little Grey Rabbit was a Grey Rabbit? 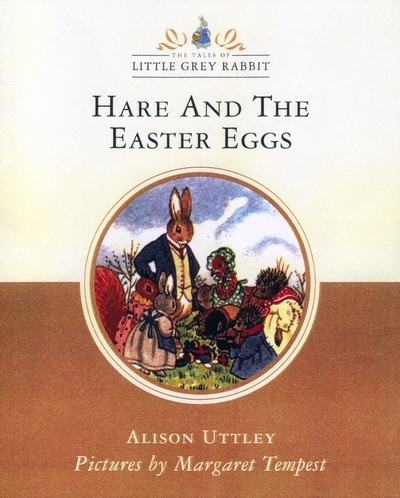 Alison Uttley published her first Little Grey Rabbit book in 1929. Based on a brilliantly imagined community of animals with homely, sensible Little Grey Rabbit, vain and selfish Squirrel and the boastful and adventurous Hare at their centre, these square little books, beautifully and sensitively illustrated by Margaret Tempest, were soon selling in their hundreds of thousands, making their author,Alison Uttley, a household name. With a varied and supporting cast of characters, including Moldy Warp the mole, Fuzzypeg the little hedgehog, Wise Owl, Water Rat, the Speckledy Hen, and many more, the thirty or so tales describe the everyday life and the adventures, trials and dilemmas of their woodland characters, upon whom the occasional swooping danger descends and is contained by a mixture of good sense, togetherness and courage. It is small wonder, then, that in the Little Grey Rabbit books the seasons, the stars, the moon and the sun, the contours and the flora and fauna of the traditional English countryside are celebrated with such tenderness and with so keen an eye. This little book was published in 1963 and the first edition carried a dedication to Longwick Church of England Combined School in Buckinghamshire, the county where Alison Uttley lived the latter part of her life. 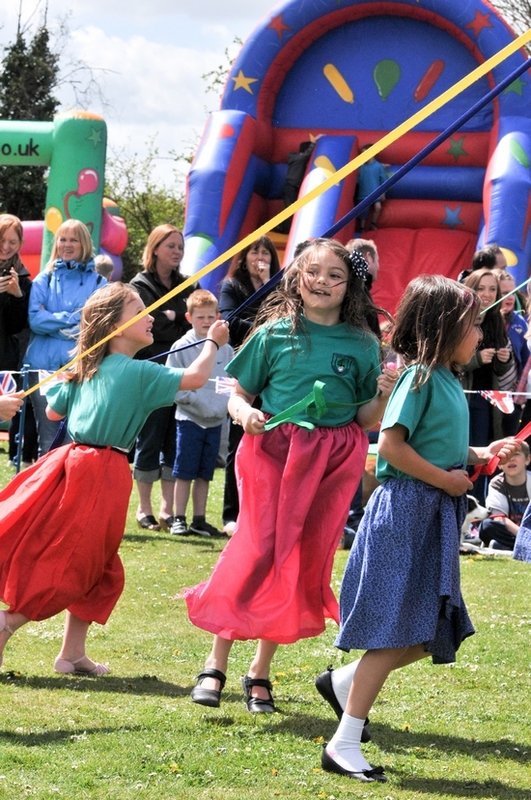 She was delighted to hear that the children there celebrated May Day, very much as she remembered it as a child in her native Derbyshire, with May Pole dancing and floral decorations. 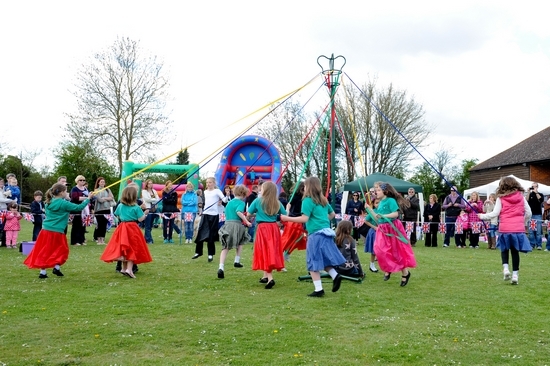 May Day has long been celebrated in the village of Longwick and the village school plays a key role in keeping the tradition alive. 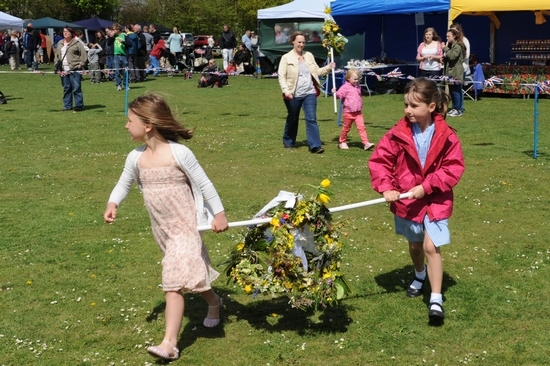 All the children and members of the local community are involved in making the sceptres and garlands that are paraded around the village on the day of the fete. 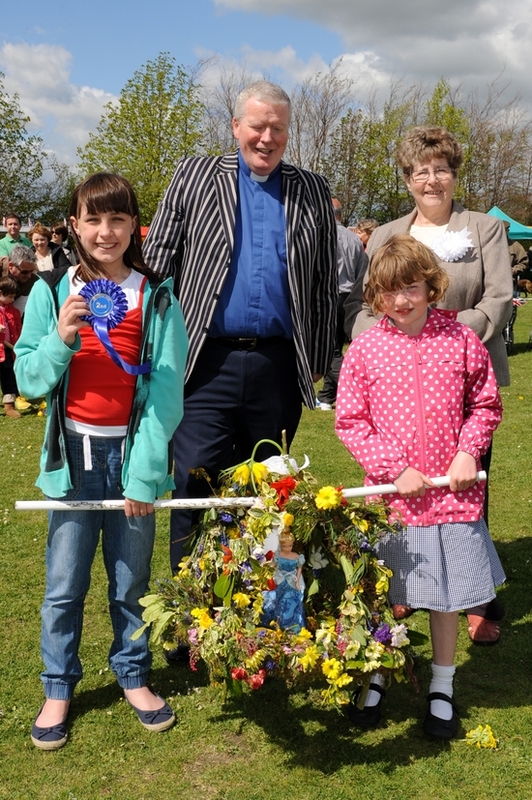 As well as a well-trained group of maypole dancers who perform several dances at the fete on the village green. The following photographs have kindly been granted for publication with the permission of Longwick School and the parents of the children involved. Does anyone know why Little Grey Rabbit was a Grey Rabbit? I grew up with the Little Grey Rabbit books. When I had children myself, I suddenly realised that Alison Uttley must be a real person. This was before Professor Denis Judd’s wonderful authorised biography. I discovered that she had lived at Castle Top Farm, and persuaded my family to find it with me. We climbed the hill and stood at the gate for so long that Mrs Clay took pity on us and invited us in. She said she often spoke to admirers of Alison Uttley. She mentioned seeing a grey rabbit on the lawn. It hadn’t occurred to me before that moment to consider why Alison Uttley had chosen a grey rabbit. I said: ‘I’m excited to hear about the grey rabbit, Mrs Clay. I think you should write and publish that you have really seen one.’ But I noticed that she then sounded a little vague, as if she wasn’t quite sure that she had. Back home, I looked at the first paragraph of The Squirrel, the Hare and the Little Grey Rabbit. I have an old Xerox copy of the handwritten manuscript from the John Rylands University Library. I saw that the phrases about Hare and Squirrel were full of corrections. But Little Grey Rabbit seemed to emerge effortlessly without any need for editing. In the rest of the series is a group of brown rabbits, and also a black rabbit. They are given a few characteristics, but not a distinct unforgettable character like Little Grey Rabbit. 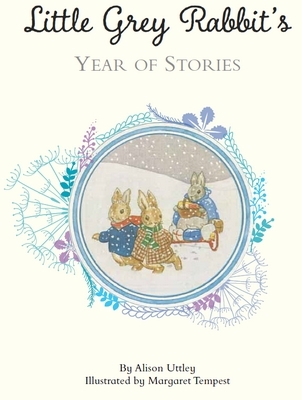 On the front cover of The Private Diaries, the picture of Little Grey Rabbit looks brownish, the same colour as Hare. So I checked with the first editions of the series. Surely Alison Uttley must have given her approval to the beautiful Margaret Tempest illustrations? The first picture opposite the first page of the 1929 publication of The Squirrel, the Hare and the Little Grey Rabbit shows Grey Rabbit raking, in a grey dress and distinctly grey fur. Clearly, she has always been a grey rabbit. So I am curious to know whether Alison Uttley had seen a real grey rabbit, perhaps in Lea Woods during those long walks to and from school, as Professor Judd has suggested. Or did she invent her? 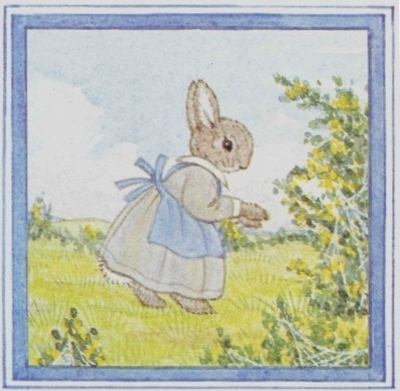 Little Grey Rabbit, created by Alison Uttley, drawn by Margaret Tempest.